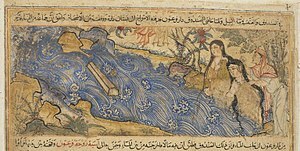 Asiya (Arabic: آسيا‎), alternatively Asiyah (Arabic: آسية‎), sometimes called Asiya bint Muzahim, is revered by Muslims as one of the four best women of all time, the other three being Mary (mother of Jesus), Khadija (wife of Muhammad) and Fatimah (daughter of Muhammad). She is described in the Quran as the wife of the Pharaoh, who reigned during the time of Moses (Musa). She is believed to have secretly accepted monotheism after witnessing the miracle of Moses in her husband's court. The tradition holds that Asiya worshipped God in secret and prayed in disguise fearing her husband. She adopted Moses and convinced his husband Pharaoh not to kill him. She died while being tortured by her husband, who had discovered her monotheism and retaliated to her rebellion against his tyranny. Muslims believe that Asiya came from a rich family and that she was a very beautiful and generous woman. Her marriage to the Pharaoh was arranged. Unlike her husband, she was humble and accepted the faith that Moses and Aaron were preaching. Although she had exceeding wealth, she was not arrogant like the Pharaoh. She realized that faith was far more important and was thus exalted by God amongst the women of her generation. Asiya and her maids were at the neighbouring Nile river one day. To their amazement, they found a crate floating in the river. Asiya immediately ordered that the crate be brought out on shore. The maids thought there was a treasure in the crate, but instead found a baby boy, Moses. Asiya instantly felt motherly love towards him. She told the Pharaoh about the baby. The incident has been described in the Quran. And Pharaoh's wife said: A refreshment of the eye to me and to thee – slay him not; maybe he will be useful to us, or we may take him for a son. And they perceived not. Asiya then offered Moses's mother to live in their household as his wet nurse and paid her for her services, unaware of their relationship. When she witnessed the death of a believing woman under her husband's torture, she declared her faith before Pharaoh who tried to turn her away from the faith, but Asiya refused to reject the God and the teaching of Moses. On the Pharaoh's order, she was tortured to death. Many men reached perfection but none among the women reached perfection except Mary, the daughter of Imran; and Asiya, Pharaoh's wife. ^ Encyclopaedia of the Qur’an. Leidan: Brill, 2001. Print. ^ Avner Gilʻadi (1999). Infants, Parents and Wet Nurses: Medieval Islamic Views on Breastfeeding and Their Social Implications. Brill Publishers. ISBN 9789004112230. ^ Ṭabarī; Brinner, William M. (1991). The children of Israel. SUNY Press. ISBN 0-7914-0688-1. ^ Renard Although the Quran says that she prayed to God to save her from Pharaoh and some Muslim traditions even say that she was migrated when Moses was delivering the Israelites., John (1998). Windows on the house of Islam: Muslim sources on spirituality and religious life. University of California Press: Continuum International Publishing Group. ISBN 0-520-21086-7. ^ Renard, John (1998). Windows on the house of Islam: Muslim sources on spirituality and religious life. University of California Press. ISBN 0-520-21086-7. ^ Turfe, Tallal Alie (1996). Patience in Islam: sabr. TTQ, INC. ISBN 1-879402-32-7. ^ Quran 66:11: "And God sets forth, as an example to those who believe the wife of Pharaoh: Behold she said: 'O my Lord! Build for me, in nearness to Thee, a mansion in the Garden, and save me from Pharaoh and his doings, and save me from those that do wrong':"
This page was last edited on 13 April 2019, at 18:44 (UTC).